People from Bengal have a saying; Machhe y Bhate Bangali which translates to fish and rice make a Bengali. 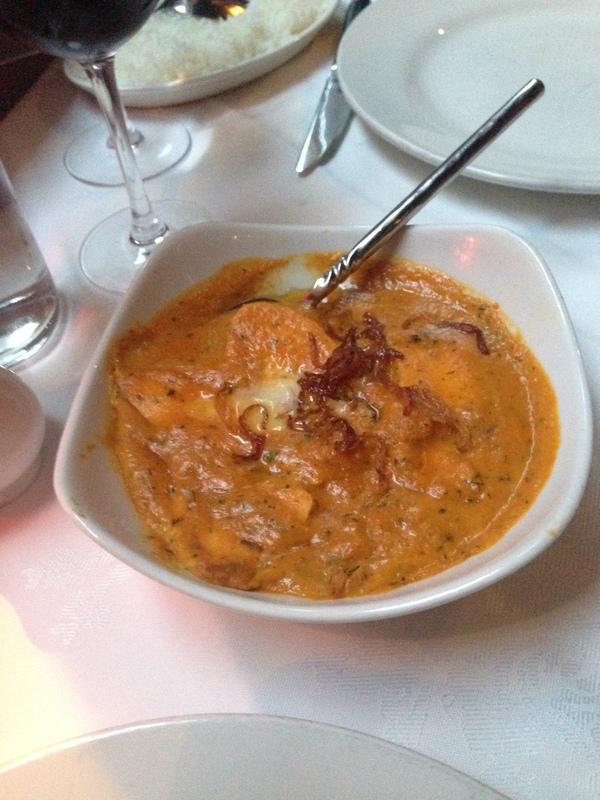 Many Indian restaurants in the UK are quite often run by Bengalis and that’s why I was pretty excited to try Bengal Tiger; I am a big foodie and love trying cuisines from all cultures. 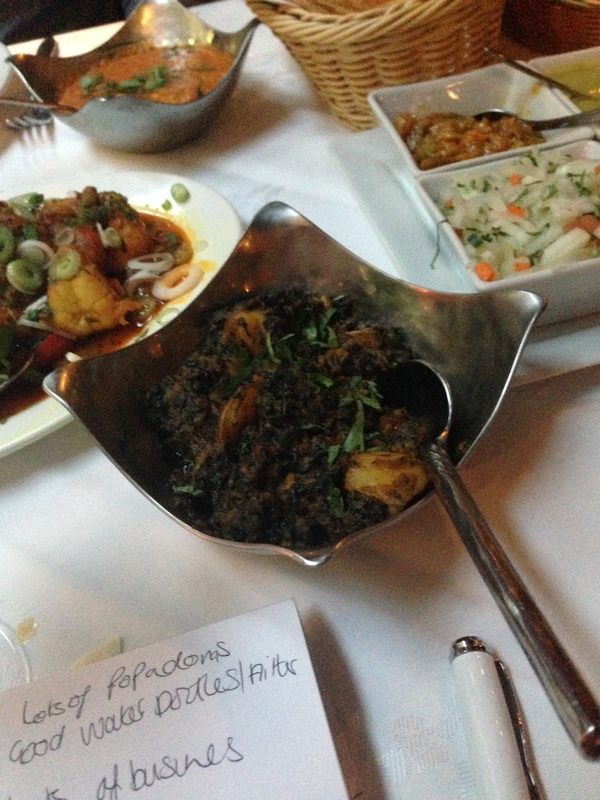 I decided in advance that I wanted to try dishes I would order in a normal Indian restaurant, as well as seafood which is associated with Bengali cuisine. 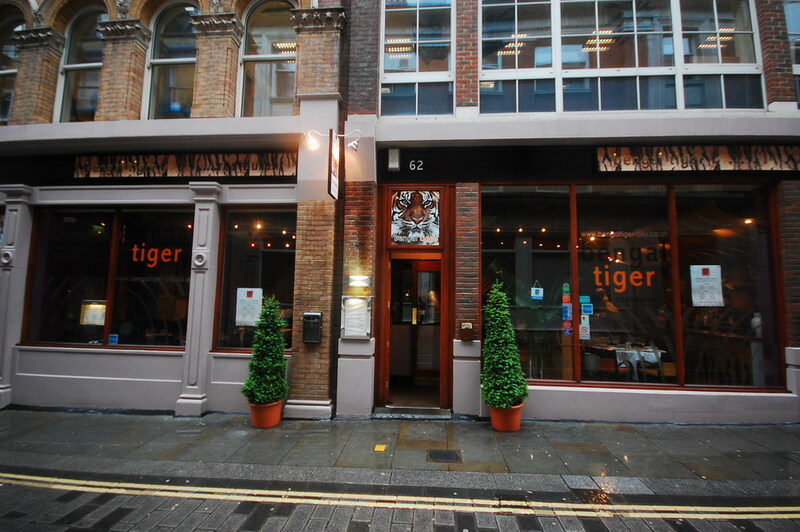 Bengal Tiger is located in upmarket St Pauls, nestled on a quaint cobbled street called Carter Street and about 5 minutes from both St Pauls and Blackfriars stations. We arrived a little early so had cocktails in Patch bar next door (where there is Happy Hour until 7pm) we then made our way to the restaurant just after 7.30pm. The restaurant had started to fill up, mainly with groups of people who seemed to have come straight from work. I liked the fact the restaurant was playing Bollywood music instead of lounge/sitar music which has become ubiquitous of Indian restaurants in the city of late. 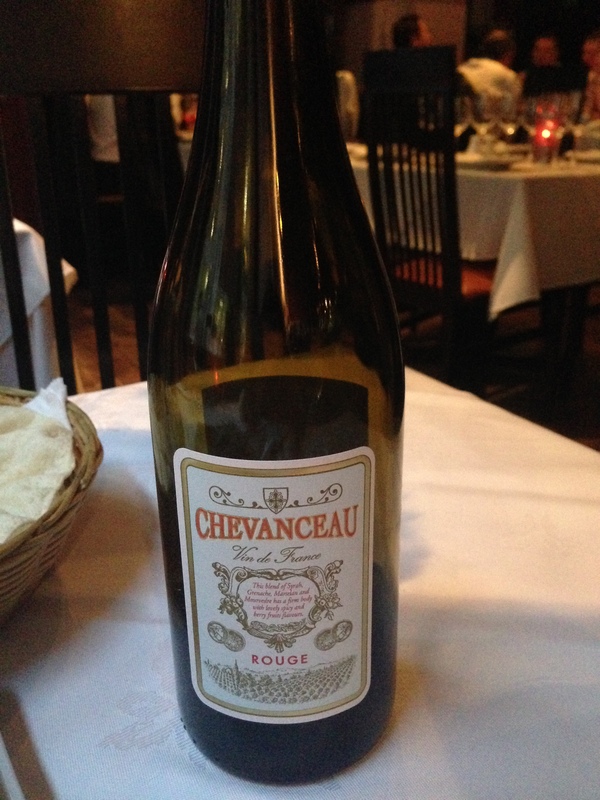 We started with a bottle of French red house wine called Chevanceau which really complimented the meal without being over powering and ordered a very generous tray of poppadum’s. The tray came with four condiments: green chutney, mango chutney, pickles and fresh onions/tomato. I have to say that the green chutney was one of the most delicious green chutneys I have ever tasted with notes of cucumber and fresh mint – we had to ask for another pot of it! We also asked for tap water which was served in a filter bottle and that was a nice touch. For the starters we opted for the mixed platter. 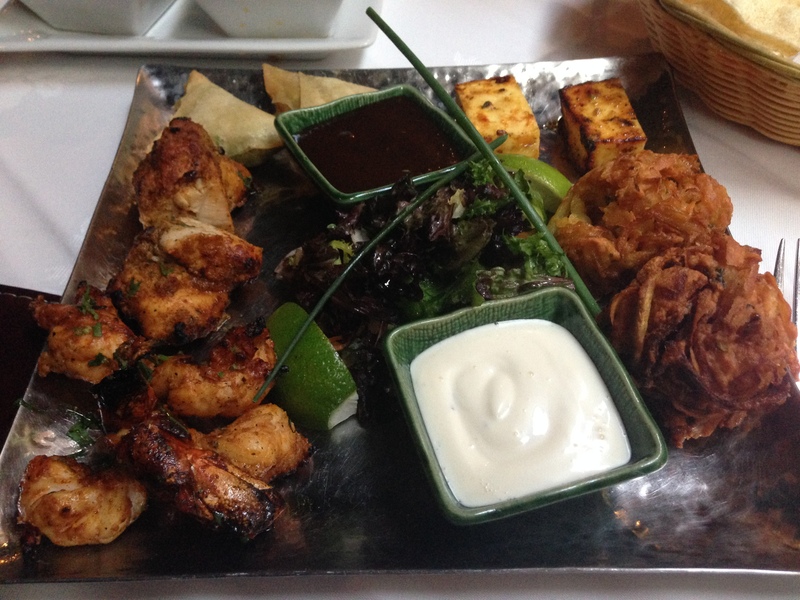 The platter comes with lamb kebabs, vegetable samosas, onion bhajee’s, chicken tikka and paneer tikka but we asked for the lamb to be swapped with King Prawns which the team were happy to do as I wanted to sample seafood. I thought the samosas were the perfect size for a platter and tasted very ‘homestyle’– they were mini but not too small and had a tangy veggie filling. The onions bhajee’s were quite big but should have been slightly crispier but again well-seasoned. The King prawns were indeed King Prawns as they were massive with a succulent texture and with the perfect amount of seasoning; the prawns were not too spicy but not too bland and left you wanting more. The chicken was cooked to perfection but should have been a little spicier and the platter came with a tamarind sauce and a spicy mayo which I have never tried before but that was a nice change to the yoghurt and mint chutneys you get at the local Indian restaurant. The food was served on a nice silver tray. 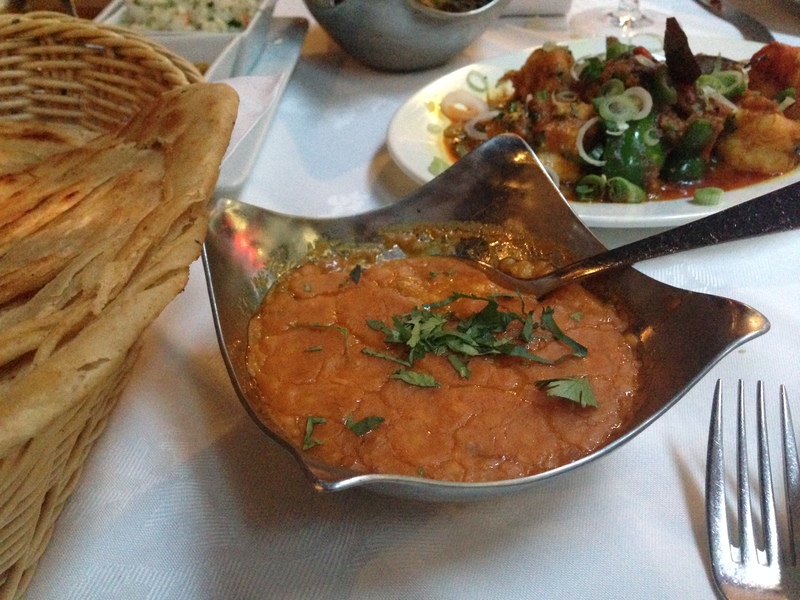 For mains we had Butter Chicken, King Prawn Badshahbag and small dishes of Tarka Dal & Saag Aloo. We ordered plain rice and a parotha as accompaniments. The parotha was authentic and crispy and the rice light and fluffy. The butter chicken was different as the chicken was in long slices and sweeter than I usually have in Indian restaurants but still extremely tasty. 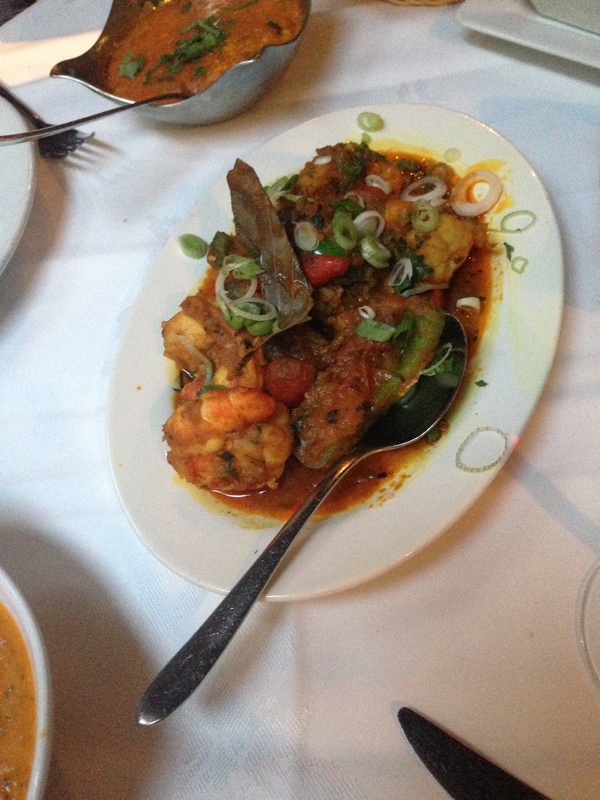 The prawns were big, succulent and tender as per the starters; they had a lovely, light but delicious flavour. The dal and saag were cooked to perfection and reminded me of something my mum would make at home and I suppose many mums from South Asia would. To finish we shared a Passionatta and had coffee’s. The Passionatta was a nice end to the meal. 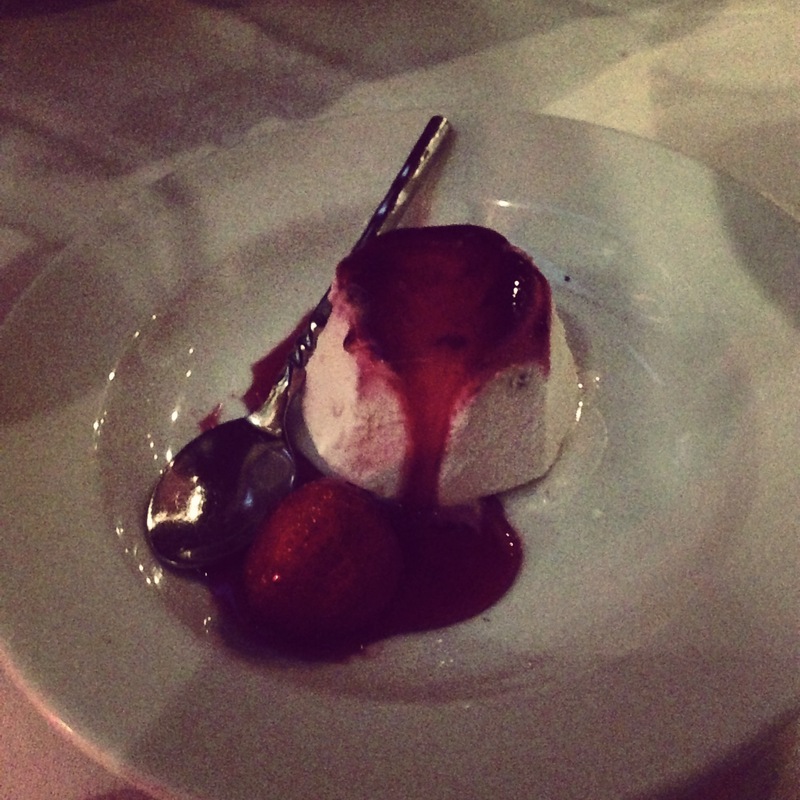 It was a creamy, strawberry dish and was smooth on the tongue after an Indian meal – kind of a strawberry version of raspberry ripple! Overall we liked the location, the service was excellent and even though the food should have been slightly more spicier (I thought, but my guest didn’t think so) I wouldn’t hesitate to go back. Don’t prawns count? I would say so!